"do you know who this is? I'm curious because he looks just like me, except a little younger." He was referring to THIS picture I had on my tumblr page. 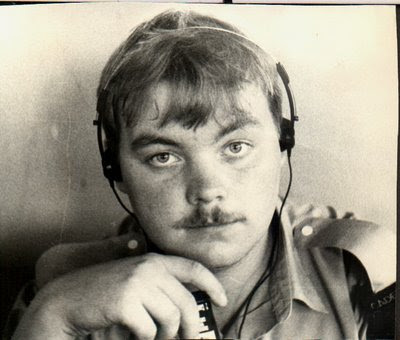 It's me at cadet camp in 1982 but could pass for a WWII picture. Does that mean I have a twin out there? And if I do, which one is the good twin and which one is the evil twin? Until I see what he looks like I will have to believe that he is sniffing glue. Your pic makes me think of a young David Hemmings. It's not so bad to grow up to look like him. I always thought I would be more of an Orson Wells kind of old guy. With a top hat and monocle like Mr Moneybags from Monopoly. Or Mr Peanut. A little younger? Than derbygoose is now? The most likely explanation is that derbygoose is your long lost son that you never knew you had. I always thought id grow old looking like John Steed with bowler and brolly. I have no lost lost sons M.D. I told you I was a virgin. Oh. I thought you were just fibbing about that because your Mom was in the room. Hmm... Any other word from the person? I will doing an update if and when I do hear from 'the D-Goose' again.